Google Earth is an amazing thing, and it’s hard to understand what’s truly going on in the Timor Sea simply by looking at pictures, so I’ve created a Google Earth collection that shows the coordinates provided in the major treaties affecting the region: the 1972 Indonesian-Australian Seabed Boundary Agreement [PDF], the 1981 Provisional Fisheries Surveillance and Enforcement Arrangement [PDF], the 1989 Timor Gap Treaty, the 1997 Water Column Boundary Agreement, the 2002 Timor Sea Treaty, and the 2006 Sunrise IUA/CMATS. 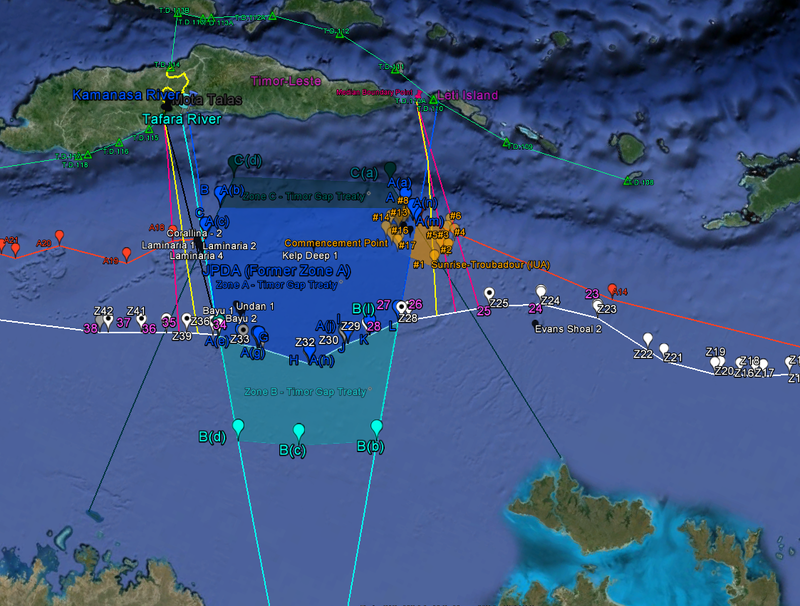 The Google Earth collection for the Maritime Boundaries in the Timor Sea can be downloaded here. If you’re interested in figuring out how all these treaties work together, it is probably more useful to just go ahead and play around with it on Google Earth, but I’ve provided a visual summary below using screencaps from the collection. In 1974, with the prospect of an Indonesian annexation of Timor on the horizon, Australia faced an important question: would Australia receive more favorable access to the gas and oil fields in the Timor Sea if Timor had an (a) Portuguese government, (b) Indonesian government, or (c) independent government? We should press ahead with negotiations with Portugal on the Portuguese Timor seabed boundary, but bear in mind that the Indonesians would probably be prepared to accept the same compromise as they did in the negotiations already completed on the seabed boundary between our two countries. Such a compromise would be more acceptable to us than the present Portuguese position. For precisely this reason however, we should be careful not to be seen as pushing for self-government or independence for Portuguese Timor or for it to become part of Indonesia, as this would probably be interpreted as evidence of our self-interest in the seabed boundary dispute rather than a genuine concern for the future of Portuguese Timor. We should continue to keep a careful check on the activities of Australian commercial firms in Portuguese Timor. (Policy Planning Paper, Canberra, May 3, 1974). In other words, Australia should continue to engage in negotiations with Portugal to avoid the appearance of any impropriety, but it should take care that the negotiations did not actually culminate in an agreement. Although Australia’s economic and foreign interests were best served by an Indonesian Timor, it was for precisely that reason that Australia wanted to avoid any appearance that it had any stake in Timor’s outcome. If seen to support Indonesia’s annexation of Timor, it would likely be viewed as doing so for self-serving commercial reasons. At the same time, neither did Australia wish to be seen as supporting a Portuguese Timor or an independent Timor, because doing so might have the effect of promoting either of those outcomes. Taking such a position (or appearing to take such a position) would also pose a risk of complicating its relationship with Indonesia.